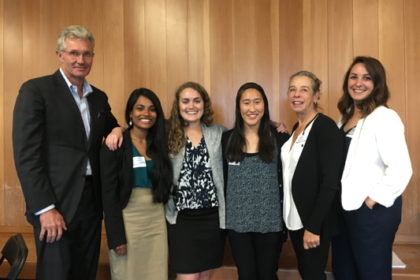 On a sunny day in mid-May, fourteen teams from across the country convened at UC Berkeley to compete in the second annual Bay Area Global Health Innovation Challenge, hosted by San Francisco Bay Area universities and the HealthRoots Foundation for Global Health. The competition, launched last year at the 2016 Consortium of Universities for Global Health (CUGH) conference in San Francisco, offered the opportunity for university innovators across the globe to pitch their ideas for low-cost and high-impact innovations to experts in global health, social entrepreneurship, and venture capital. This year’s Challenge featured a full day of workshops and panel discussions where teams had the opportunity to hear from global health experts and innovators on how to navigate the global marketplace. After a lively panel with Bay Area innovators Haripriya Mukundarajan (Prakash Lab, Stanford University), Jason Bellet (Eko Devices), and Dianne Kane (Medic Mobile), teams participated in workshops led by Dr. David Shoultz (PATH), Zoé Bezpalko (Autodesk), and 2016 Innovation Challenge grand prize winners, Gabrielle Wimer and Joyce Lu (MealFlour). During the final pitch session, each team was given five minutes to pitch their idea, and five minutes to answer questions from the judging panel. After intense deliberation, the judges settled on three winners. The $10,000 HealthRoots Grand Prize was awarded to Katya Cherukumilli from UC Berkeley for Global Water Labs, which seeks to treat groundwater for excess fluoride in rural India. In second place, from Harvard-MIT Health Sciences, Mohammad Ali Naija presented Sanviato, an affordable coagulation monitoring technology intended to help monitor patients being treated with anti-coagulant pharmaceuticals. In third place, from Stanford University medical students, Shreya Sanjay Desmukh, Kaushik Sridhar, and Naside Gozde Durmus described their point-of-care idea to evaluate biological samples for the presence of the malarial parasite with magnetic levitation. Through their collaboration on this Challenge, UC Berkeley, UC Davis, UCSF, and Stanford’s Center for Innovation in Global Health strive to provide a bridge between student-driven ideas developed in the academic space to the global health marketplace. The Bay Area offers an ideal stage for teams to present their innovations, due to its strengths in health and social impact, philanthropy, and technology. For more information, and to subscribe to the newsletter for notifications about next year’s competition, please visit the Challenge website. 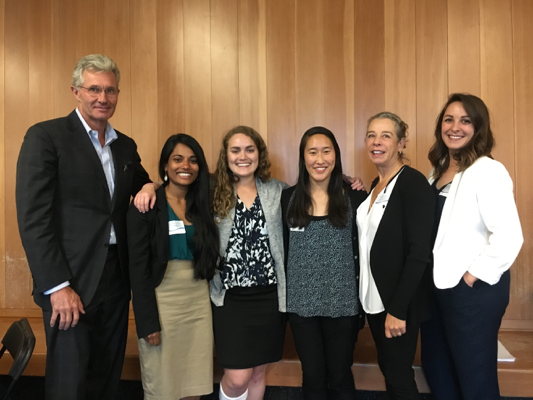 Photo caption: 2017 Bay Area Global Health Innovation Challenge HealthRoots Grand Prize Winner Katya Cherukumilli (second from left) with 2016 Innovation Challenge Winners MealFlour, Gabrielle Wimer and Joyce Lu (third and fourth from left, respectively) with Dr. Eric Grigsby, Mary Rocca and Camille Rocca of the HealthRoots Global Health Foundation.